Mother Teresa, a Catholic nun who devoted her life to helping India's poor, has been declared a saint in a canonization Mass held by Pope Francis in the Vatican. 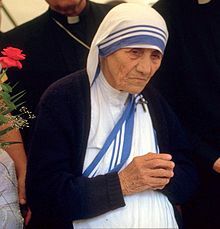 Mother Teresa, also known as Saint Teresa of Calcutta, (born Anjezë Gonxhe Bojaxhiu Albanian 26 August 1910 – 5 September 1997) was an Albanian-Indian Roman Catholic nun and missionary. She was born in Skopje, Republic of Macedonia, then part of the Kosovo Vilayet in the Ottoman Empire. After having lived in Macedonia for eighteen years, she moved to Ireland and then to India, where she lived for most of her life. Saint Teresa founded the Missionaries of Charity, a Roman Catholic religious congregation, which in 2012 consisted of over 4,500 sisters and was active in 133 countries. They run homes for people dying of HIV/AIDS, leprosy and tuberculosis; soup kitchens; dispensaries and mobile clinics; children's and family counselling programmes; orphanages; and schools. Members must adhere to the vows of chastity, poverty, and obedience, as well as a fourth vow, to give "wholehearted free service to the poorest of the poor". Saint Teresa was the recipient of numerous honours, including the 1962 Ramon Magsaysay Peace Prize and 1979 Nobel Peace Prize. On 19 October 2003, she was beatified as "Blessed Teresa of Calcutta". A second miracle was credited to her intercession by Pope Francis, in December 2015, paving the way for her to be recognized as a saint by the Roman Catholic Church. She was canonised on 4 September 2016, a day before the 19th anniversary of her death. A controversial figure both during her life and after her death, Saint Teresa was widely admired by many for her charitable works. She was both praised and criticized for her anti-abortion views.She also received criticism for conditions in the houses for the dying she ran. Her authorised biography was written by Indian civil servant Navin Chawla and published in 1992. ~ If you judge people, you have no time to love them. ~ Not all of us can do great things. But we can do small things with great love. ~ Peace begins with a smile. ~ I am not sure exactly what heaven will be like, but I know that when we die and it comes time for God to judge us, he will not ask, 'How many good things have you done in your life?' rather he will ask, 'How much love did you put into what you did? ~ Every time you smile at someone, it is an action of love, a gift to that person, a beautiful thing. ~ Yesterday is gone. Tomorrow has not yet come. We have only today. Let us begin. ~ Do not think that love in order to be genuine has to be extraordinary. What we need is to love without getting tired. Be faithful in small things because it is in them that your strength lies. ~ Kind words can be short and easy to speak, but their echoes are truly endless. ~ Let no one ever come to you without leaving better and happier. Be the living expression of God's kindness: kindness in your face, kindness in your eyes, kindness in your smile. ~ The most terrible poverty is loneliness, and the feeling of being unloved. ~ If we have no peace, it is because we have forgotten that we belong to each other. ~ God doesn't require us to succeed, he only requires that you try. ~ It's not how much we give but how much love we put into giving. ~ I alone cannot change the world, but I can cast a stone across the waters to create many ripples. ~ The hunger for love is much more difficult to remove than the hunger for bread.